Children as young as 11 years old are writing malicious computer code to hack accounts on gaming sites and social networks, experts have said. A report from antivirus company AVG detailed evidence of programs written to “steal” virtual currency. In one case, researchers were able to reverse-engineer “amateur” code to reveal data about the identity of one child in Canada. The company said children must be educated on coding “rights and wrongs”. “As more schools are educating people for programming in this early stage, before they are adults and understand the impact of what they’re doing, this will continue to grow.” said Yuval Ben-Itzhak, chief technology officer at AVG. The researchers found that many instances of malware targeting games popular with children shared the same characteristics. Most were written using basic coding languages such as Visual Basic and C#, and were written in a way that contain quite literal schoolboy errors that professional hackers were unlikely to make – many exposing the original source of the code. The team examined closely one particular instance of code that masqueraded as a cheat program for gamers playing Runescape, an online title that has over 200 million signed-up players. 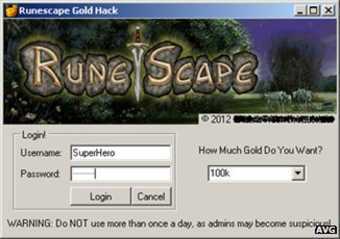 The program, Runescape Gold Hack, promised to give the gamer free virtual currency to use in the game – but it in fact was being used to steal log-in details from unsuspecting users. “When the researchers looked at the source code we found interesting information,” explained Mr Ben-Itzhak to the BBC. That email address belonged, Mr Ben-Itzhak said, to an 11-year-old boy in Canada. Enough information was discoverable, thanks to the malware’s source code, that researchers were even able to find out which town the boy lived in – and that his parents had recently treated him to a new iPhone. Many schools around the world are changing education programmes in schools to teach children to code, rather than simply to use, computers. In the UK, several after-school clubs have been set up – and initiatives to get kids into programming have been backed by the likes of Google and Microsoft. Mr Ben-Itzhak said that, as the ability level of children increased, more needed to be done to educate them on how best to use their new skills. Linda Sandvik is the co-founder of Code Club, an initiative that teaches children aged nine and up how to code. She told the BBC that the benefits from teaching children to code far outweighed any of the risks that were outlined in the AVG report. “We teach English, maths and science to all students because they are fundamental to understanding society,” she said.